Hello creatives! It’s Surreal Saturday once again and we are here to give you another set of surreal art inspiration to fuel your creativity today. We have seen a lot of portrait artworks before, and most of the amazing artists in this field uses uncommon materials like ballpoint pens, old blue jeans and even fire in the art called pyrography. Today we add another awesome artist to this long list. His work is so unique not only on the subject and artistic style but most especially in his use of ink tea and alcohol. Carne Griffiths in his studio. Photo by Silvia Krupinska. 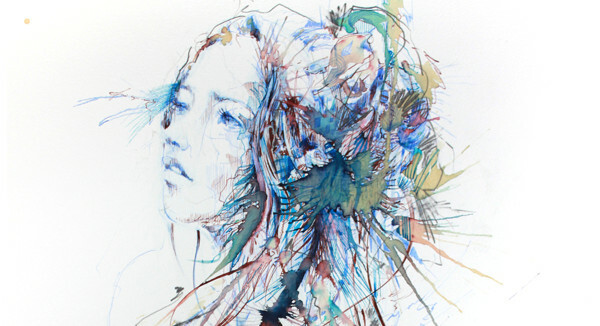 Meet Carne Griffiths, UK-based artist who creates amazing portraits using calligraphy inks, graphite and liquids such as tea, brandy and vodka. His fascination with drawing is focused on the manipulation of the drawn line creating human, geometrical and floral forms as a literal or abstract interpretations of images encountered from his daily life. Each piece has this dreamlike sense, an escape from reality projecting awe and wonder that invites every viewer to share and explore its inner realm. Check out more of Carne Griffiths’ works on his Behance portfolio or visit his personal website for more information and updates. Which among the artworks is your most favorite? Share us your thoughts as well us your suggestions for our next Surreal Saturday post by leaving a comment below. Stay awesome everyone!